It’s fair to say that the notion of fan-based film projects based on big name nerd franchises has become rather tainted of late. In fact, the concept has found itself drenched in the acrid, puerile futility of the most embarrassingly clueless, inward-looking, out-of-touch rage campaign lately seen on an internet full of raging man-babies. Yes, The Last Jedi remake, I am look at you, and I am looking hard. What is it? A mockumentary based on a real-world documentary, based on Star Wars. Troopers go on patrol, and run into some familiar faces. Why is it good? Dating way back to 1997 – back when the Star Wars prequel trilogy was still an exciting, almost incomprehensible dream rather than an all-too real nightmare – Troops tells a story in parallel with the events of A New Hope, and was pretty much the first major tipping point for the evolution of internet-distributed fan-films. It’s a parody of police documentary series Cops, but with Stormtroopers on patrol on Tatooine. One of the first fan-films to have notable production values and a relatively professional, franchise-authentic look, Troops is kind of ground zero for unofficial projects with series quality aspirations. It’s also pretty damn funny. What is it? Eight minutes of pure, distilled, deeply atmospheric bat-essence, as Bats goes up against famous enemies old and new. Why is it good? One of the earliest, most legendary, ‘serious’ fan-films of the burgeoning multimedia internet of the early ‘00s, Dead End made a huge splash when it first appeared online, back in the days when video streaming was barely a thing and you pretty much had to download this stuff to watch it. It’s a little 2003 in places now, and its age means that no real HD version is available, but as a solid slab of serious, atmospheric Bat-direction that really understands the tone and feel of the character and his world, it remains a cracker. Both Kevin Smith and comics artist Alex Ross threw compliments its way, and with good reason. Director Sandy Collora even made a point of creating two separate capes, one for general use, one really long, heavy one to recreate that dramatic, wraithlike, ‘slow stand-up moment. You’ll know it when you see it. Goosebumps every damn time. Oh, and wherever you think it’s going at the start, it really, really isn’t. What is it? A more comics-focused Judge Dredd 'short' (it's actually half an hour long), but no less gritty - or impressively executed - than the big-screen version. Why is it good? Released a year after the brilliant Dredd, Judge Minty is more closely based on the original Judge Dredd comics, though it does blend its bleak, desaturated visual style somewhat with the earlier, official movie. Following the (comics canon) story of Minty, an aging Judge beginning to soften into feelings of compassion in his advanced years, the film is a strong depiction of the classic ‘retirement in the Cursed Earth’ trope. It’s also a fantastic showcase for movie-quality prop and costume design on a non-professional budget, nailing the feel and personality of the source material along the way. As such, it did a great job of acting as a stop-gap around the start of that long, tortuous, “Make a Dredd sequel” period. We have Netflix’s Mega City One coming now, but Judge Minty, we thank you for your service during that difficult time. What is it? Glorious. high-energy, Star Wars space battle, by way of '80s Japan. Why is it good? 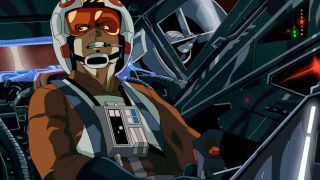 “What if there was an Empire-focused short Star Wars animation, drawn with the crazy detail and shading of classic ‘80s anime that's all but vanished from Japan nowadays?” So asked comically over-talented animator and one-man studio Paul Johnson. And then he basically just made exactly that. Over his weekends, for four years. Not a moment of this thing isn’t downright staggering, from the perfectly recreated art and animation style, to the swooping, swirling, dynamic camera, to the genre-authentic wailing guitars that make up TIE Fighter’s soundtrack. Packing in a brilliant amount of character and narrative into one stunningly choreographed, wordless battle sequence, three years on it’s still pretty much the coolest thing on the planet. What is it? That dark, gritty reboot of the Mighty Morphin’ Power Rangers you never knew you wanted and were probably pretty sure you didn’t. But it's great. What is it? About the most original (but brilliantly fitting) cross-genre take on a comic book movie you're going to find. Why is it good? A satirical, charismatic character drama focused around a notorious Marvel villain and sometime anti-hero, presented as a low key, black-and-white tribute to groundbreaking 1992 Belgian crime mockumentary Man Bites Dog. If you get the reference, you’re almost certainly no longer reading this, as you’re very probably already watching with a great deal of excitement. If not, just watch it. Come for the beautifully observed recreation of arthouse Euro-cinema, stay for the slow, inevitable descent into comic book ultra-violence. Oh, and stick around for the post-credits scene. It is good. What is it? Another Bootleg Universe production, and an early shot at redemption for a comics character short-changed too many times before. Why is it good? Another Marvel anti-hero short, this time starring Tom Jane in the lead role. And, yes, if that casting has you suspecting that you know who this one is about, you are 100% correct. After appearing in the maligned, 2004, pre-MCU Punisher film, Jane got on board with this project as a means of making amends and doing the character and the fanbase proper, gritty justice. Screened at the 2012 San Diego Comic Con, Dirty Laundry sets a decent foundation for the brutal, desaturated, character-driven take on Frank Castle that would eventually appear in Daredevil season 2 and the Punisher Netflix series. In fact, current Punisher Jon Bernthal has cited Jane’s performance in this short as an inspiration. Need any more convincing to watch it? Ron Perlman is also in it. Yeah, there we go. What is it? A focused, enigmatic showing for a villain who really deserved better. Why is it good? A solid 20 minutes of relentless, Darth Maul vs. Jedi action. Arguably one long fight-scene with minor narrative bookends, it’s nonetheless a great piece of choreography and assured action direction, executed with great pacing and energy. It also actually manages to add a little depth and character development to Maul himself, maintaining the essence of his established personality but making him believable in a way that The Phantom Menace never even attempted. What is it? A great little expanded universe-style semi-sequel to Gremlins 2. Why is it good? Recall neatly fast-fowards the Gremlins narrative to right here, right now. Maintaining the darkly satirical, blackly funny ethos of the original films, it's set some years after Mogwai have been medically ‘fixed’ so as to finally function as safe pets, without any of that inconvenient ‘feeding after midnight, murderous rampage, chainsaws and bloodshed’ fallout. Naturally, things go wrong. Making great use of its budget and resources to tell a focused story based around a single location, while also expanding the series’ lore and wider world in a way that rings true, the only downside to Gremlins: Recall is that it will make you really, really annoyed that we don’t have Gremlins 3 yet. What is it? A brutal and dramatic slice of Star Trek history, and a set-up for much bigger - and bloodier - things to come. Why is it good? Seen Star Trek Discovery? This is pretty much the short film version, but released two years before CBS’ official prequel series was even announced. How Discovery is it? It’s set in the Prime timeline, and it’s an account of the brutal, early days of the Federation-Klingon war, when initial clashes led to a long term grudge, eventually spawning a drawn-out, bloody conflict that at time threatened to ruin both civilisations. It’s also gritty as heck. The only difference is that it plays out as a talking-head mockumentary looking back at the period with key Starfleet and Klingon personnel. That does not, however, make for a dry, academic read-through. Prelude to Axanar’s CG budget is ludicrous, and its action choreography is fantastic. Also, Tony Todd is in it. He is, as you’d hope, both booming and dramatically rousing. As the title suggests, this was designed as the prequel to a planned, full-length Axanar film, but after a lengthy bout of legal wrangling with Paramount, that will now become two 15-minute shorts. What is it? More than an hour and 20 of full-blown Metal Gear Solid fan movie, made on next-to no budget but looking borderline professional in places. Why is it good? Created by an Italian team over the course of around four years, MGS: Philanthropy follows Snake’s operations with the titular anti-Metal Gear ‘terrorist’ organisation around the time of MGS2’s prologue. And ye gods is it ever authentic. In fact, the Hive Division team’s work on this one has since led to official Rainbow Six: Siege and Battlefield 1 tie-ins with Ubisoft and EA. Entirely true to the look and feel of the games, Philanthropy even goes as far as to direct its dialogue dub to recreate the exact tone and flow of Metal Gear Solid’s voiceovers. The story was intended to be completed in a second part, which series game director Hideo Kojima said he was ‘anxious’ to see, but - in a narrative perhaps prophetic of the future - Konami put the brakes on, stalling the dreams of fans and Kojima alike. The last chunk of the film released was a 12-minute teaser for the second part. You can (and should) check it out here. That lot got you rehyped about your favourite movie series and stories? Check out our list of the best upcoming movies of 2018 and beyond, to see what the official versions have to offer in the immediate future.